Keeping tabs on competitor Twitter accounts takes time and effort. And without data, analyzing competitor accounts is like trying to see through concrete. But Twitter competitor analysis may be easier than you think. You just need the right tools. And in this post, we’ll walk through a simple Twitter competitor analysis guide. Let’s dive in. Twitter competitor analysis gives insight into competitors Twitter activity. It analyzes account attributes, metrics, and weekly performance trends. Now that we have an idea of Twitter competitor analysis. The next stop is hammering out what we want to analyze. While you’ll never have access to competitor Twitter analytics, there are ways to get competitor insights. Here’s what to looks for. With our analysis plan now ready, let’s dive into the each more closely. Account attributes give you an overview of your competitor’s profile. Here are a few account attributes you should focus on. Interaction style shows you how competitors communicate with followers. Keep your eye on how competitors stack up to your account’s interaction style. Account age This data shows if competitors are new to the scene, developing, or established. Activity is where we get into the meaty details. Here we’re looking for how active accounts are on Twitter. Keep an eye out for highly active competitors. These accounts are making strides to engage with your audience. Engagement showcases how your community is responding. Competitors with high engagement are worth looking into. Their content is gaining traction in the industry. Now you have a background on competitor Twitter accounts. So it’s time to dive into detailed data. Account metrics dive deeper into competitor analysis. 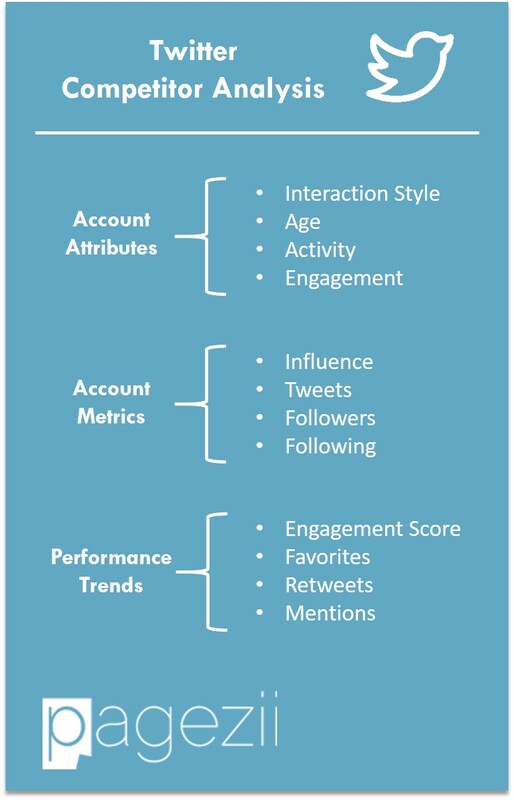 Influence score is a scores twitter accounts based on account metrics. It takes the detailed data and sums it up. If you’re seeing movement here, it’s worth looking into. Tweets tally up all communication your competitors have sent to online communities. You can use this data with account age to see just how active your competitors are. Followers and following are straightforward metrics. They give you an idea of the competitor account size. Understanding competitor account metrics gauges where you stand in the industry. Now it’s time to dive deeper with weekly performance trends. This is where you take Twitter Competitor Analysis to the next level. Engagement Score indicates how engaged communities are with your competitors. Engagement refers to competitor Twitter activity and interaction they receive. If you’re noticing competitor engagement always in the green, you know they are doing something right. 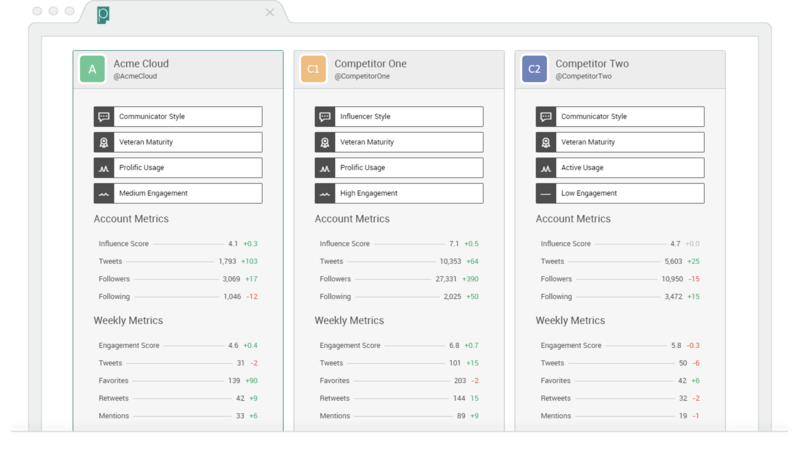 Weekly Tweet tracking gives you intel on competitor Twitter strategies. You can use this data to see if competitors are scaling social promotion. Favorites, Retweets, and Mentions give you the concrete numbers on competitor engagement. Track this data each week to see how receptive communities are to the competition. We’ve laid out the blueprints for Twitter competitor analysis. It starts with understanding your competitors on Twitter. After that, you can dive deeper into their account mechanics. And finally, looking at their weekly performance gives you key insight into their promotion strategy. You can get this data sent directly to your inbox week using the Twitter Analysis Report. You now have the knowledge and tools for Twitter competitor analysis. Use them moving forward and take your Twitter strategy to the next level.